Not everyone spends their golden years in good health and surrounded by loving family members. This is what can happen to people who fall between the cracks. It took so long for the romantic subplot to show up that I briefly wondered if this book had been mislabeled. The pay off was well worth it, though, as the characters involved in it were really well-matched. They’d gotten to know one another so well over the course of previous scenes that I was happy to see them realize they might make a good couple. The pacing slowed down dramatically and became uneven about halfway through the narrative. I was surprised to see this happen due to how well everything flowed together earlier on. The plot grew so quiet that my interest in it wavered. There simply wasn’t enough going on in that section despite the intriguing premise. There are some ingrained patterns of behavior that people remember long after they’ve forgotten what year it is or the names of their grandchildren. Some of the most memorable scenes explore how these habits play out in an institutional setting. It was fascinating to see exactly how similar they were from one patient to the next regardless of what kind of life they had lead before being diagnosed with dementia. Sarah’s personality was an enigma. It took me a long time to figure out what kind of person she was, and I was never quite sure if my impression of her was what the author was trying to convey. There simply weren’t very many hints about her temperament, and the ones that did show up were occasionally contradictory. For example, one of her longterm goals is to go back to school to become a nurse. That kind of career track demands quick thinking, a sharp mind, and the ability to thrive under pressure. While I liked Sarah a lot, she never struck me as someone who would relish working in this kind of environment. This story did a great job showing the most common ways people behave when they have dementia. Yes, there were violent outbursts and bathroom accidents, but there were other moments that were peaceful or even funny. The author struck a fair balance between all of these different possibilities and never dwelt on any one of them for too long. 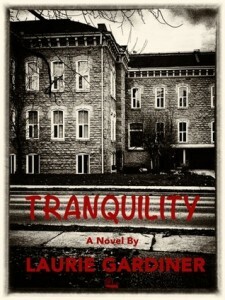 Tranquility was a thought-provoking tale. I’d especially recommend it to anyone who has ever had a loved one move into a nursing home.